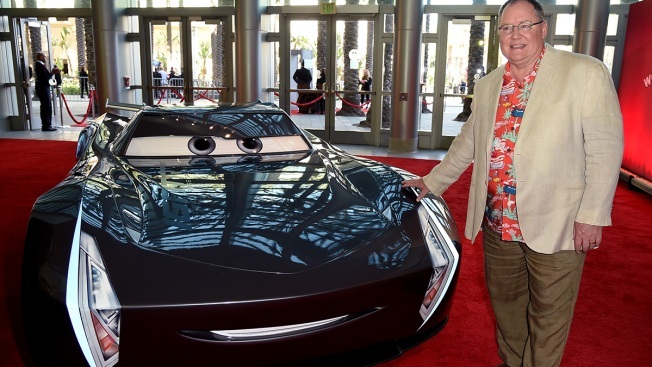 In this June 10, 2017, file photo, Pixar co-founder John Lasseter attends the premiere of Disney and Pixar's "Cars 3" at Anaheim Convention Center in Anaheim, Calif.
John Lasseter, the co-founder of Pixar Animation Studios and the Walt Disney Co.'s animation chief, will step down at the end of the year after acknowledging "missteps" in his behavior with staff members. Lasseter in November took what he called a six-month "sabbatical." He apologized "to anyone who has ever been on the receiving end of an unwanted hug" or any other gesture that made them feel "disrespected or uncomfortable." At the time, Lasseter signaled that he hoped to then return to Disney. Many in Hollywood were skeptical that was possible. "The last six months have provided an opportunity to reflect on my life, career and personal priorities," Lasseter said in a statement. "While I remain dedicated to the art of animation and inspired by the creative talent at Pixar and Disney, I have decided the end of this year is the right time to begin focusing on new creative challenges." The 61-year-old Lasseter, easily recognizable for his bright Hawaiian shirts, is the highest-ranking Hollywood executive to be toppled in the wake of the #MeToo movement that followed Harvey Weinstein's downfall in October. A pioneer in digital animation, Lasseter has been a creative force behind every Pixar release as well as Disney hits like "Frozen," ''Moana" and "Zootopia." Lasseter directed Pixar's breakthrough feature "Toy Story" as well as it first sequel, "Toy Story 2"
After Disney acquired Pixar in 2006, Lasseter was named chief creative officer of Pixar as well as Disney Animation. Under Lasseter, the previously flagging animation studio was reborn through both Pixar and Disney releases that have amassed billions in box office and a string of Oscars. Bob Iger, chief executive of Disney, praised Lasseter for his vision and assembling storytellers and innovators "to set the standard in animation for generations to come." "John had a remarkable tenure at Pixar and Disney Animation, reinventing the animation business, taking breathtaking risks, and telling original, high quality stories that will last forever. We are profoundly grateful for his contribution, which included a masterful and remarkable turnaround of The Walt Disney Animation Studios." Pixar's latest, "Incredibles 2," is due out next week. Lasseter is an executive producer of the anticipated sequel, which is expected to be among the biggest box-office debuts for an animated release. Disney didn't announce a successor to Lasseter.